Over the last month, we’ve been working hard to finish up the coding and environment for, and finally the filming of, a series of tutorial videos. It’s something we’ve been working on at my job since, solidly, May, and but for a few release-based loose ends (“will our requirements.txt file really work with pip? why isn’t it working over … THERE?” etc etc), the project is over, and my contract is coming to a close. So I have a few projects I’d like to work on, AND NATURALLY, document for you! 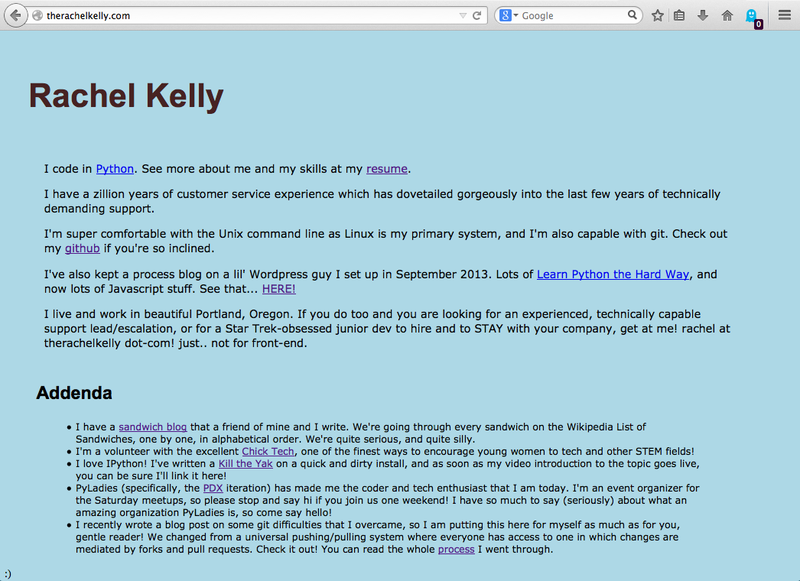 First, let me point you to my website, which I have hugely upgraded. I’ve got a style sheet which I first applied just to the main page, then I applied it to the resume which I also updated, a bit, though it’s difficult since each position I apply for has a subtly different set of information. Regardless, I’m proud of the small, attractive changes I’ve made. Next up is to get a handle on some bootstrap and cherry-pick pieces of it, like the nav bar and a few other nice ideas. Next, I’d like to run through another codecademy class, maybe the advanced web design one, but what’s more likely is the API-manipulation course. At some point soon I’d like to begin a project where I get a couple of the open APIs out there to talk to each other. My intention is not to re-invent the wheel, but to get a look at its inner workings myself! I’m also about 60 pages through Jon Loeliger and Matthew McCullough’s Version Control with Git, 2nd ed, which is only about a year old, so quite up to date. As I’ve said, I want to be a Git wizard, and to earn that pointy, star-covered hat, it’s time to take a deep dive. It’s extremely exciting to me that I can read this book – when he (it seems like it’s mostly Loeliger’s game) says “The first number, 100644, represents the file attributes of the object… [and] should be familiar to anyone who has used the Unix chmod command.” which I am! I am familiar with chmod, Unix, and so much more relating to this topic! Wow! This is not to say that chmod is a particularly difficult concept, but that it is NOT a terribly entry-level topic either – I am rather beyond entry-level knowledge for many topics, and that is enormously gratifying. brief aside: chmod refers to the the command which determines the level of permissions of a given file or directory. go here for more information. want to write more on this in the future, because I still haven’t found a super terse explanation. So this Git book is great. They’ve already referenced someone that I KNOW, so that’s charming and a bit surreal. I suppose living in (the extremely small town of) Portland and being as active in the communit(y/ies) as I am, it’s bound to happen that I’ll meet or already know some People. But on to it – the book practically begins with SHA1 numbers, the hash number that Git assigns to a unique commit. Did you know that if your file is named yourfile and it says the same thing that my file, also called yourfile, says, then the SHA1 will be identical? WILD. Mind = blown. Apparently there is (very infrequently) a concern of “collision,” or two different kinds of commits yielding the same hash, but as the SHA1 has approximately 2^160 permutations (pretty sure I can’t use that word here? ), that’s pretty unlikely. So for now, the plan is to write about whatever I’m learning in the Git book, because the Git book is awesome. SEE YOU NEXT TIME!